Urban Kayaks Summer Camp is a learn-to-paddle kayak and paddle board program for kids ages 10 - 16 designed to help children get comfortable on the water. Campers will have the opportunity to learn about kayaking and paddleboarding in the safe, calm waters of Monroe Harbor, all while enjoying new activities and camp favorites! On water group activities will give campers the chance to challenge themselves and make lasting friendships. Activities include: Kayak and paddle board lessons every day, swimming, sports and games, arts and crafts, outdoor education, and more! Your child will receive personalized attention from our experienced instructors with a 1:5 instructor to student ratio. All campers must know how to swim. Explorers will have the opportunity to learn about kayaking and paddle boarding in the safe, calm waters of Monroe Harbor, all while enjoying new activities and camp favorites! On water group activities will give campers the chance to challenge themselves and make lasting friendships. Activities include: Kayak and paddle boarding lessons every day, swimming, sports and games, arts and crafts, outdoor education, and more! Groups are kept small to ensure individualized attention. All campers must know how to swim. Adventurers will have the opportunity to learn about leadership and teamwork while embarking on longer kayak and paddle board trips. Campers will learn safety and rescue techniques and hone their paddling skills. Activities include: Kayak and paddle board lessons every day, swimming, sports and games, arts and crafts, outdoor education, and more! Groups are kept small to ensure individualized attention. All campers must know how to swim. Early Drop Off begins at 8am at our Monroe Harbor location and is an additional $20 per day per child. Late Pick Up ends at 4:30pm at our Monroe Harbor location and is an additional $20 per day per child. Camp Hours: Mon-Fri 9am-3:30 pm. How to Dress: Wear a swimsuit and bring a change of clothes and towel. Athletic waterproof sandals and a hat are also a good idea. Lunch: Campers need to bring their own non-perishable lunches, drinks, and snacks. Swimming: Certified instructors will assure that each camper enters the water at an appropriate pace and skill level, however all campers must be able to swim on their own. Health & Safety: Upon registration, you will be asked to complete a medical form for your child. Please be certain it contains all the information needed to properly care for your child. Feel free to contact the Urban Kayaks Office prior to registration to discuss any health concerns. Registration before May 1: Once the registration form below is completed, a staff member will be in contact to request a refundable deposit of 25 percent per child with each registration. The balance is due June 1, 2019. Tuition is refundable until June 1, 2019 (less the 25 percent per child deposit). After June 1, 2019, all monies are non-refundable. Registration after May 1: Full payment is due with each registration. Tuition is refundable until June 1, 2019 (less the 25 percent per child deposit). After May 1, 2019, all monies are non-refundable. Registration after June 1: Full payment is due with each registration. All monies are non-refundable. Owner of Urban Kayaks, Aaron is an American Canoe Association (ACA) certified instructor and has spent the last 12 summers paddling the Chicago River and Lake Michigan. During the winter months, Aaron and brother Asher can be found on the slopes of Colorado teaching children's ski school and coaching in children's basketball leagues. When Aaron is not kayaking he is playing fetch with his Chocolate Lab Joni. 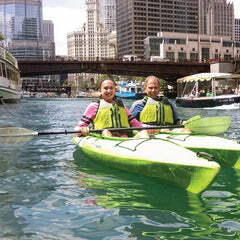 Owner at Urban Kayaks, Asher is an American Canoe Association (ACA) certified instructor and is one of the most experienced and qualified instructors and guides on the Chicago River. Asher has spent many winters and summers coaching children's skiing and athletics. In his off time, you can find Asher caring for Oliver, his prized Cavapoo.